The typical household is so full of chemicals and various cleaning products, therefore it was little wonder last months post on natural kitchen cleaning tips for the microwave and dishwasher was so popular. Continuing on that natural trend, I have tried and tested some great natural bathroom cleaning solutions too. Unless you are equipped with state of the art tankless hot water heaters, your shower heads can become rather clogged and dirty with lime scale and various gunk that travels through the pipes. Over time no only does it lose it’s sparkle, but you may even find the water pressure reduced as well. The same can occur with sink faucets around the house so this can be done in the bathroom, kitchen, laundry… even your outdoor faucets if you wish. A solution to this is to create a natural shower head cleaner chemical reaction using those same amazing household products you already likely have. Add the bicarb to the bag then add in the vinegar. You will likely want to do this either in the shower itself or over the sink as the chemical reaction can get very fizzy. Cover your shower head or faucet with the bag so they are submerged in the solution. Tie the bag on with an elastic band (or make do with a hair band like I did) and leave it in place for at least a couple of hours to work the magic. When you remove the bag, your shower head and faucets will be much cleaner than a simple scrub alone however you may need to give it a little scrub to remove the final build up. An old toothbrush or scrubbing brush is perfect for this. There you have it… another natural cleaning solution for your home using those 2 key ingredients… bicarb and vinegar. Not only natural and simple but also super thrifty! For further bathroom tips and hints, grab the free printable bathroom declutter checklist and cleaning schedule template to help you in your journey to a cleaner, more simplified home. What are your bathroom super clean tricks and hints? This is awesome! 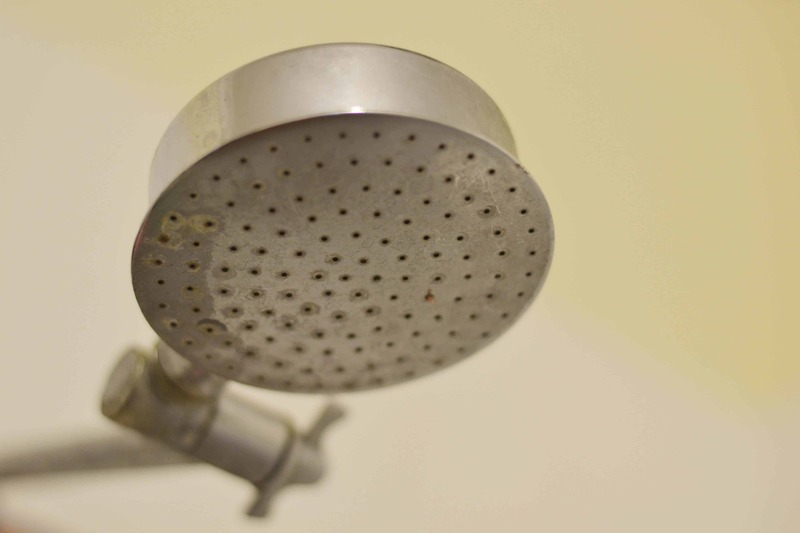 I so need to do this…some of the holes in my shower head are clogged and I didn’t know of a good way to clean them out (aside from spending an hour with a toothpick and attacking each hole, which wasn’t high on my to-do list, lol). I will be giving this a try this weekend! Thank you for sharing this! What a great tip for cleaning these things! My shower head is always getting filled with Iron and lime as my water source is from a well. I am going to have to try this concoction out, it’s also great that it’s all natural. You look like you have had some really good results with it. Thanks for sharing your secret recipe! I have to admit, adding baking soda does the trick. I used to do it just with vinegar before. Great advice ! What an incredible tip for cleaning these things! My shower head is continually getting loaded with Iron and lime as my water source is from a well. I will need to attempt this invention out; it’s additionally extraordinary that it’s all characteristic. You seem as though you have had some great outcomes with it. Great ideas for cleaning the shower faucet. Thanks for sharing such an excellent idea for cleaning shower faucet. Helpful Information. I appreciate your hard work. It will be helpful for every housekeeper. What is your opinion about the new mainstream vinegar and daybreak dish cleanser as a tub/shower cleaner? How do you feel about the new popular vinegar and dawn dish soap as a tub/shower cleaner? Is that safe to use?